I’m going to start this eggy post off with an admission- I don’t really love eggs. I like them a bit, but only if they are loaded with cheese and veggies and don’t really taste too much like eggs. It might seem a little odd- but it’s just one of my more quirky food issues (I cannot and will not eat condiments, a story for another time). I do love scrambled eggs, omelets, and frittatas though- and often whip them up for breakfast, brunch, or breakfast-for-dinner. 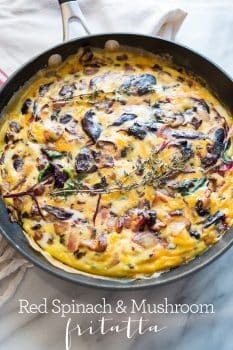 I love to find new flavors to combine to make frittatas new and interesting- and when I stumbled upon a bag of red spinach mix at Trader Joe’s, I thought it would be the perfect addition to a meat-free meal- and this Red Spinach and Mushroom Frittata was born. The trick to a delicious- and not dried-out- frittata is a good balance of filling, fats, and eggs. 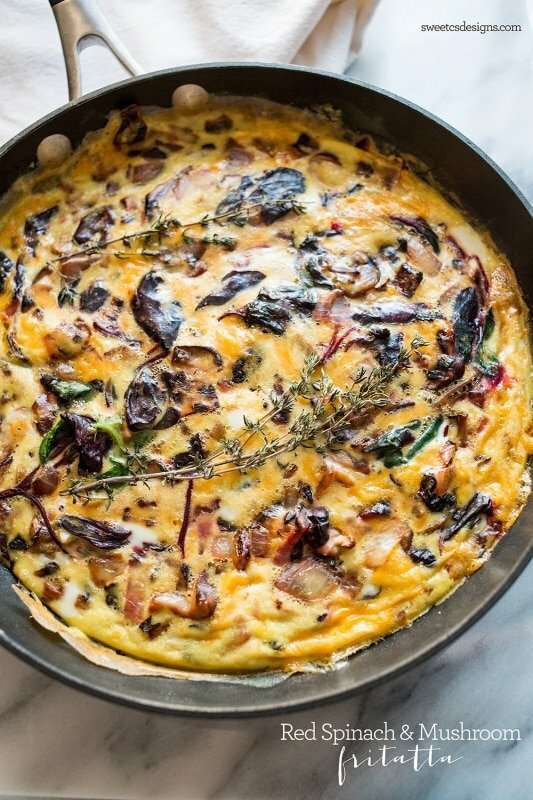 You don’t want to overload your frittata with cheese or it will be a greasy mess- and under-filling it can make it dry and less stable. 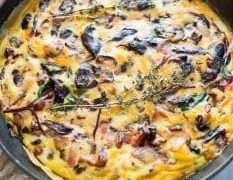 I like a frittata packed with veggies- it is healthier, stretches the eggs out, and helps you sneak in so many vegetables into a meal. The classic spinach and mushroom pairing is slightly elevated here with red spinach- it has a slightly sweeter taste, and a bit more bitterness- almost a little cabbage-like. 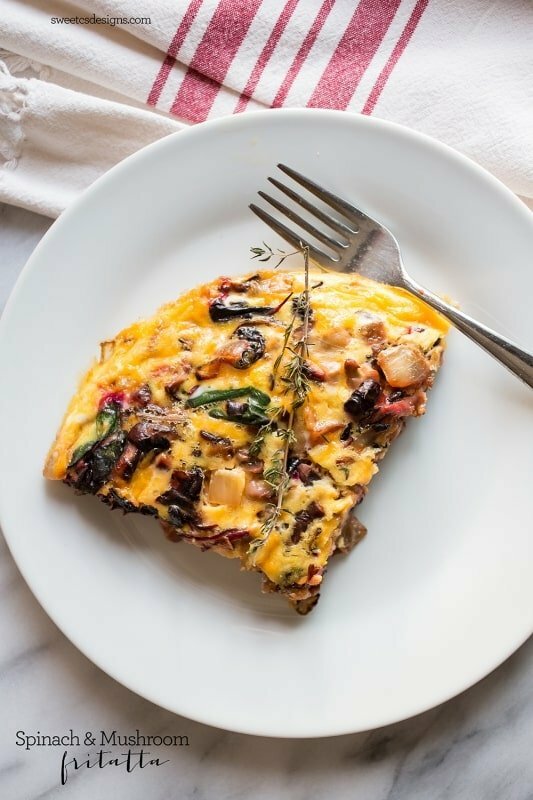 The red color is also incredibly vibrant and intriguing against eggs and rosemary- and brightens up a dish that would otherwise be dominated by brown mushrooms. While the mushrooms might not have the most vibrant colors, they do pack a meaty flavor, while still remaining meat free. The trick to getting a meaty taste from these mushrooms is allowing them to sufficiently brown with diced onions- browning=flavor! Don’t rush the process, or your mushrooms will be gummy and bland. We want them soft, rich, and buttery- full of a very beef-like flavor that pairs so well with eggs. If you end up with leftovers, these pack well for lunches. I like to wrap them in foil in slices for my husband to take to work- a quick zap in the microwave and it’s a delicious lunch. You can also put it in between an english muffin or a bagel for a tasty twist on a breakfast sandwich! Just don’t reheat too long, or it will dry out. In a large skillet, melt butter on medium. Add diced onion, and sautee until soft. Add mushrooms and garlic, cook until brown and liquid has released. Add spinach mix and cook until it has wilted. In a bowl, whisk eggs until slightly frothy. Pour eggs and cheese over skillet and lightly stir to mix. Lay rosemary, salt and pepper over the top. Bake until eggs are firm, about 10-15 minutes. Yum! This looks great. I miss Trader Joe’s a lot as I’m now living in London. But I’ll keep my eye out for some red spinach here! I like eggs, but in very small quantities and only scrambled or boiled. I don’t know what it is about them, but I just can’t seem to eat very much of them without feeling like I’ve eaten a dozen eggs and will be sick if I eat one more bite. This recipe sounds delicious. Will have to give it a try. Thanks for sharing! You sound just like me Pam!